Clancy - Save-A-Life, Inc.Save-A-Life, Inc. I just want to share our story with you. 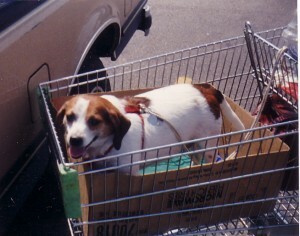 Many years ago we adopted a little dog from Save-a-Life. At that time, the pet adoption was being held in front of the Wal-Mart at Chatham Plaza, and I just happened to be passing by that Saturday. I saw this adorable little Jack Russell Terrier/Beagle mix (?) and fell in love. However, I wasn’t sure that Hubby would feel the same way…so I went home without Clancy. By the next day, I’d convinced the rest of the family that we just HAD to get this little dog. I called Ms. Friedman and we made arrangements to pick him up from her home at the Landings. That was November 18, 1990! When we took Clancy to our Vet the next week, he estimated that Clancy was already at least a year old — maybe more — and that would make him 19 now! Believe it or not, Clancy is still going strong! We call him our little Energizer Bunny. He just keeps going and going. He’s slowed down a little over years and no longer jumps from the floor up onto the couch or the chairs. (He has his own set of stairs.) He still loves to ride in the car and eagerly goes with us. I can’t begin to tell you how much we love this little dog and the joy he has brought into our lives all these years. Here are some pictures of Clancy.